Editor’s Note: We are pleased to present this guest post by Dr. Lon Kilgore. The concept that exercise behaves as medicine is becoming widespread, repeated often enough by exercise academics and the media that it seems to be nearing acceptance as fact. As such it would appear, superficially, that personal trainers are working as cogs in the field of medicine. As attractive as this concept is to some, it is not the actual circumstance within which personal trainers find themselves. When the promotional veneer of the exercise-is-medicine initiative is peeled back and its actual basis and workings are examined, it appears that exercise organizations are trying to paint personal trainers into a tiny occupational corner. As one can see by the exaggeration that the ACSM “establishes the exercise guidelines that all other certifications use for training and certification,” the organization fails to appreciate that it, as an organization, has only limited reach and impact on the world of personal training. ACSM is dedicated to advancing and integrating scientific research to provide educational and practical applications of exercise science and sports medicine. This narrow focus began a disconnect between the organization and those in the trenches of physical education, coaching and the slowly emerging occupation of personal training. The divide in mission was large enough that when the National Strength and Conditioning Association was in its formative development, the organizers consulted with the National Athletic Trainers Association, not the ACSM, regarding potentially becoming a subordinate organization. The ACSM’s exit from AAHPERD, and the nearly universal renaming of university physical education departments to departments of kinesiology, exercise science, movement science, or some other similar name at the end of the 20th century, marked the diminishment of interest in the actual practice of creating fitness in favor of forging an identity linked to science and medicine. Everyone was running from the stench of the jock strap. Sure, other fitness associations can offer you networking opportunities, celebrity speakers and useful resources. But look closer. Where are these resources and sports medicine experts coming from? Chances are, many are coming from ACSM. Because ACSM attracts expert clinicians, researchers and academicians, we are the only organization in the world that can give you first-hand access to the leading-edge science, clinical advancements, and policy changes that shape your practice. Leading-edge science? The premise here is that the scientific findings of its academic members will provide guidance to personal trainers in their work. But only to personal trainers who join the organization, as all of the organization’s findings are locked behind a pay-for-access gateway. Does the money charged for basic membership actually provide useful practical knowledge? For a basic membership fee of US$99 per year, you still have to pay $665 more for a year’s access to its science journal through the publisher’s fee-pay system. A caution here is that we have seen that its scientific recommendations may not be as authoritative as proposed. The difference between the exercise and fluid replacement recommendations (http://journals.lww.com/acsm-msse/Fulltext/2007/02000/Exercise_and_Fluid_Replacement.22.aspx) and the consensus statement on hyponatremia (http://journals.lww.com/cjsportsmed/Fulltext/2015/07000/Statement_of_the_Third_International.2.aspx) are stark. The organization is also demonstrably disconnected from the gym with its sparse guidance on strength training, a primary profit center of any commercial fitness business, promoting eight to ten exercises for eight to twelve repetitions for one set for essentially all non-sport purposes (in ACSMs Guidelines for Exercise Testing and Prescription and http://www.acsm.org/docs/current-comments/strengthpowerandbabyboomer.pdf?sfvrsn=4). The organization does provide some excellent guidelines for clinical screening prior to exercise testing and participation. With this clear bias toward experimentation and clinical application, and given the lack of attention to the practical aspects of creating fitness in the gym, is it any wonder that while about 6,000 exercise scientists and clinicians attend the ACSM national conference, only about 900 personal trainers attend their personal trainer’s conference? Given the approximately 450,000 personal trainers in the U.S. and the fact that only a few hundred of them attend the “authoritative” gathering for personal trainers, one has to question if there is, in fact, a bona fide effort by the ACSM to aid in the development of personal trainers toward creating more fit clients. If there was indeed valuable information that created a means of becoming more successful trainers delivered at the conference, would not more than 0.2 percent of personal trainers in the U.S. attend? One of the largest disconnects from personal trainers is the “Exercise is Medicine®” certification campaign. 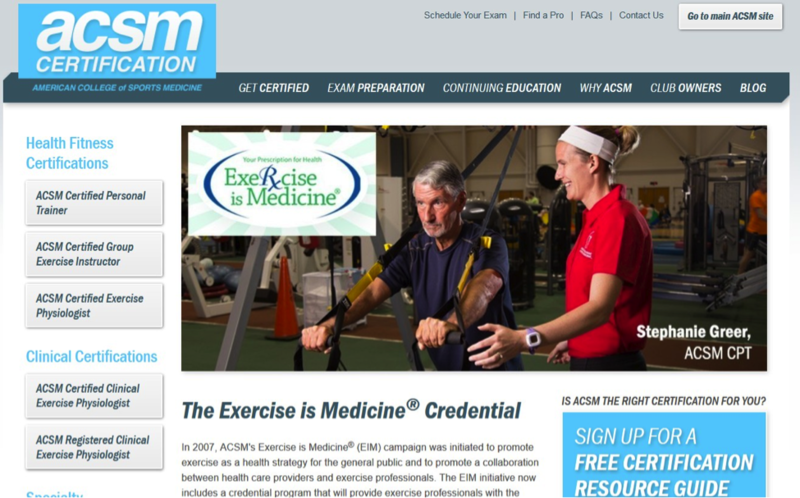 And yes, the ACSM trademarked the “Exercise is Medicine” name to exclude other groups from using those words in its certification titles, and because there is money to be made. provide exercise professionals with the opportunity to work closely with the medical community and provide numerous additional benefits to the certified professional. First, how can a certification provide the opportunity to work with the medical community? There is no defined path for this interaction to occur so that such a promise can be delivered. That in itself, is a problem. But let’s dig a little deeper to see who this certification is directed toward. It is well documented that the ACSM consulted on the District of Columbia bill that placed personal trainers under the supervision of the DC Physical Therapy Board. But that was not the first time that the ACSM approached physical-therapy groups to advance its licensure and Exercise is Medicine agenda. In 2013, a representative from the ACSM met with the president of the Maryland branch of the American Physical Therapy Association (APTA) and a national board member for the APTA. The discussion centered on raising awareness of the Exercise is Medicine campaign and licensure for clinical exercise physiologists (CEP). The outcome of that meeting was a recommendation from the APTA officers to the ACSM to consider developing a state licensing board under auspices of the Maryland Physical Therapy Licensing Board. The subsequent ACSM legislative committee minutes reporting that meeting recommended “discussion of CEP licensure with APTA on a national level.” In essence, the ACSM seems willing to negotiate for APTA support of licensure for its flagship certified membership, clinical exercise physiologists, despite the apparent requirement to surrender dominion over CEPs to state boards of physical therapy. So who is the ACSM representing? Who is Exercise is Medicine intended to benefit (other than the sedentary public)? Who can be certified for Exercise is Medicine? For the majority of personal trainers, this certification is not accessible. It requires both an NCCA accredited certification from one of 12 organizations AND a bachelor’s degree in exercise science, exercise physiology or kinesiology. That blocks over 70 percent of currently practicing trainers from applying for and receiving the credential. It also blocks physical therapists, nurses, occupational therapists, physician assistants and physicians from receiving the credential (as they do not generally have degrees in exercise or kinesiology, nor will they have one of the specified NCCA approved certifications in exercise). So who, then? Well, it appears that exercise is medicine is targeted at ACSM’s certified exercise physiology members as they have both the NCCA certification and education required. 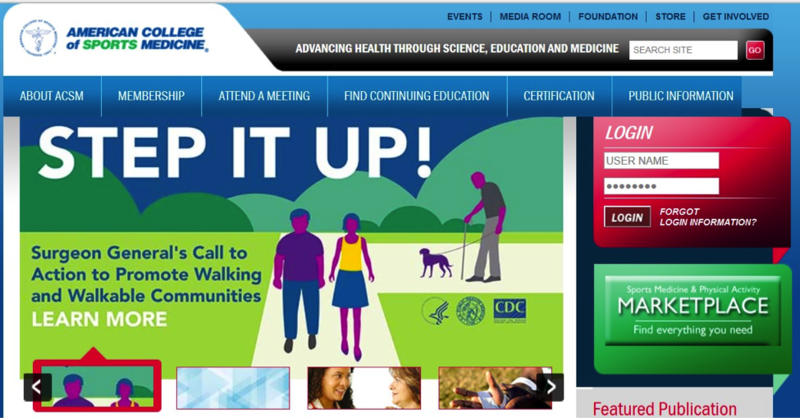 This is the ACSMs single largest initiative (funded by Coca-Cola) with its own website – http://exerciseismedicine.org/. Of note when the website contents are read is that the proposed recommendations for the public are only in respect to “physical activity” intended to improve health, not programmed exercise training with the intent to improve fitness. Further, the EIM education committee has a stated mission of developing only “medical education.” Again, fitness trainers seem to be omitted from discussions and support. So it is clear, whether intentional or inadvertent, fitness trainers are not included in ACSM functions, decisions or plans. This begs the question, are personal trainers, specifically those without university degrees, anything more to the ACSM than a revenue stream? Source: Connaughton AV, et al. Graduating medical students’ exercise prescription competence as perceived by deans and directors of medical education in the United States: implications for Healthy People 2010. Public Health Rep, 2001. Cardinal BJ, et al. If Exercise is Medicine®, Where is Exercise in Medicine? Review of U.S. Medical Education Curricula for Physical Activity-Related Content. J Phys Act Health, 2014.
less than moderate competence at performing several fundamental PA prescription behaviors. Vallance JK, et al. Medical students’ self-perceived competence and prescription of patient-centered physical activity. Prev Med 48(2):164-6, 2009. But then the other shoe drops. If the ACSM is developing a curriculum to prepare physical therapists, nurses, occupational therapists, physician assistants and physicians to deliver exercise prescriptions as stated on the exercise-is-medicine website, where does that leave fitness trainers? With half their job removed from their remit, what happens to trainer wages? What happens to client fitness progress when defensive medicine and low-to-moderate intensity physical activity become the standards for exercise prescription? What happens when, rather than recommending joining a gym and working with a fitness trainer, it becomes a national initiative to simply walk to get healthy? We will see very soon as it’s already happening. And its execution, once again, does not include personal trainers. About the Author: Lon Kilgore earned a Ph.D. from the Department of Anatomy and Physiology at Kansas State University’s College of Veterinary Medicine. He has competed in weightlifting to the national level since 1972 and coached his first athletes from a garage gym to national-championship event medals in 1974. He has also competed in powerlifting, the first CrossFit Total event, wrestling and rowing. He has worked in the trenches, as a qualified national level coach or scientific consultant with athletes from rank novices to the Olympic elite and as a consultant to fitness businesses. He was co-developer of the Basic Barbell Training and Exercise Science specialty seminars for CrossFit (mid-2000s) and was an all-level certifying instructor for USA Weightlifting for more than a decade. He is a decorated military veteran (sergeant, U.S. Army). His illustration, authorship and co-authorship efforts include several best-selling books and works in numerous research journals. After a 20-year professorial career in higher academia, he currently delivers vocational-education courses through the Kilgore Academy, provides online commentary and analysis of exercise-science papers, and works as a writer and illustrator. His training concepts and fitness standards have been included in textbooks and numerous websites. You can download free PDFs of his exercise performance standards here.